Now that the long-awaited SDTMIG 3.3 has been officially released, Pinnacle 21 team has eagerly began to implement validation rules for this new standard. As the first step, we performed a gap analysis for changes since SDTMIG 3.2. We excited to share our findings with the CDISC community, which you can find in the slides along with summary of changes below. 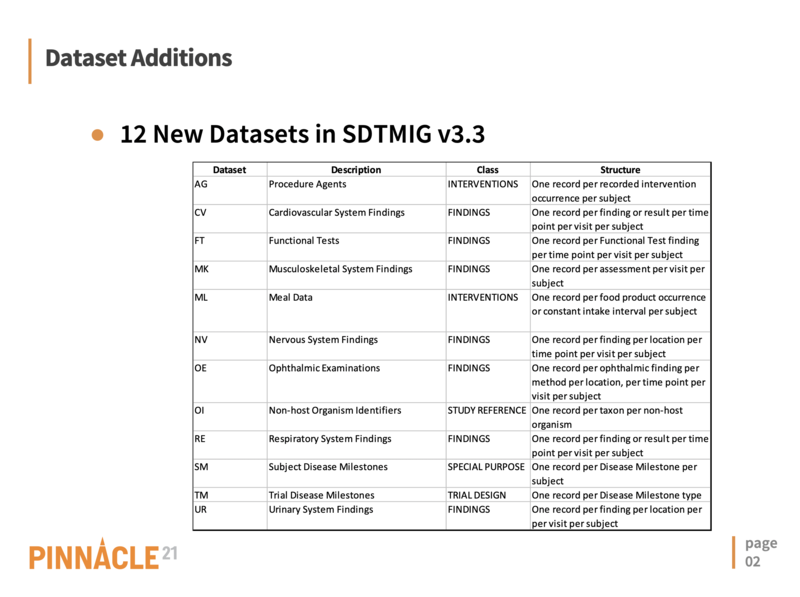 Read more about SDTMIG 3.3 – What’s New? Define.xml is "arguably the most important part of the electronic dataset submission for regulatory review,” according to The FDA’s Technical Conformance Guide. It helps reviewers gain familiarity with study data, its origins and derivations, as well as sponsor-specific implementation of CDISC standards. The next meeting of the NJ CDISC User Group will be held on Monday, Feb 27, 2017, 1-5pm at Novartis Pharmaceuticals Corporation, East Hanover campus. If you are interested in attending this meeting (in-person or online), please register by Friday, Feb 10th.